The Carilion Giles Community Hospital Diabetes Management Program will hold a Diabetes Support Group Planning Session Thursday July 27th 7–8 PM in the Cascades Room at Carilion Giles Community Hospital in Pearisburg. 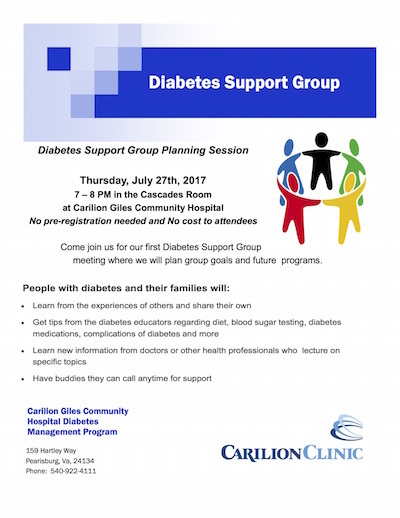 Come join them for their first Diabetes Support Group meeting where they will plan group goals and future programs. No pre-registration needed and there is no cost to attendees. For more info call 540-922-4111. Carilion Giles Community Hospital is located at 159 Hartley Way in Pearisburg, VA.